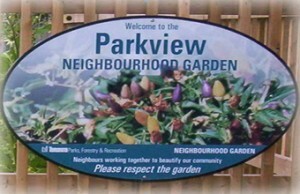 The weekend of April 22-24 is the City’s annual “Clean Toronto Together” initiative, and what better place could there be to do some cleaning than Parkview Neighbourhood Garden? So, on Saturday April 23rd, let’s meet in the garden at 10 a.m. to start cleaning! The City does not do any maintenance in the garden or the surrounding park during the winter, so litter accumulates. Although some volunteers have already started this effort, there is always more to be done (since people continue to litter). Also, some of the plants were intentionally left in the ground after our fall clean-up day, to provide habitat for birds. It is time now to pull out all of those dead plants and compost them so that we can start preparing the soil for replanting. Please join us on Saturday, April 23rd at 10 a.m. Bring rubber or gardening gloves if you have them and wear rubber boots or old shoes as the garden is quite muddy. Maybe it will actually feel like spring by then! See you in the garden.